N-acetyl-cysteine, or NAC, is a particular form of the amino acid cysteine. It offers the advantage of being an excellent precursor of glutathione, a powerful endogenous antioxidant which is involved in many of the body’s functions including, in particular, the immune system, detoxification and various cellular events essential for healthy organ function. Despite its importance, however, glutathione levels decline with age. Additional intake in the form of dietary supplements can therefore help maintain optimal levels of this key antioxidant. As an excellent source of glutathione, N-acetyl-cysteine supplement prevents deficiency in this important antioxidant and as such, offers numerous health benefits. Inadequate glutathione levels can have serious consequences for our health, contributing to the oxidative stress involved in cellular ageing and the development of diseases such as Alzheimer’s and Parkinson’s. N-acetyl-cysteine benefits thus include helping to slow down the ageing process by enabling the body to synthesise Glutathione. 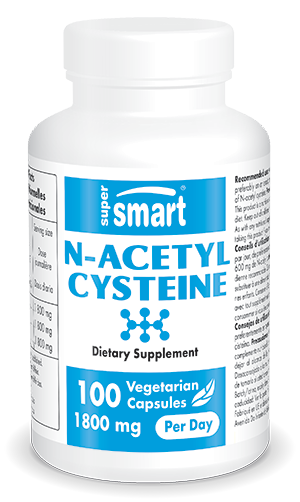 An N-acetyl-cysteine supplement represents an economical solution to maintaining adequate glutathione levels in the body. Our product has been specially formulated to offer 600mg of N-acetyl-cysteine per vegetarian capsule. A suitable dose would be 1-3 capsules a day though this can be adjusted to suit your needs. Taking vitamin C at the same time can help maximise glutathione’s efficacy in the body. If in doubt, seek advice from your therapist. To maintain or restore glutathione levels in the body, you may also be interested in our perlingual glutathione supplement. Studies show that glutathione deficiency may also be prevented by the action of R-alpha-lipoic acid. Like N-acetyl-cysteine, other active principles can also promote the synthesis of active molecules, such as is the case with dimethylaminoethanol (DMAE) , a neurotransmitter precursor. Other ingredients: maltodextrin, microcrystalline cellulose, magnesium stearate, silicon dioxide.